Nouri, M., Rahbarizadeh, F., Ahmadvand, D., Moosakhani, F., Sadeqzadeh, E., Lavasani, S., Khoddami Vishteh, V. (2010). Inhibitory Effects of Lactobacillus salivarius and Lactobacillus crispatus Isolated from Chicken Gastrointestinal Tract on Salmonella enteritidis and Escherichia coli Growth. Iranian Journal of Biotechnology, 8(1), 32-37. Mehrnaz Nouri; Fatemeh Rahbarizadeh; Davoud Ahmadvand; Farhad Moosakhani; Elham Sadeqzadeh; Shahram Lavasani; Vahid Khoddami Vishteh. "Inhibitory Effects of Lactobacillus salivarius and Lactobacillus crispatus Isolated from Chicken Gastrointestinal Tract on Salmonella enteritidis and Escherichia coli Growth". 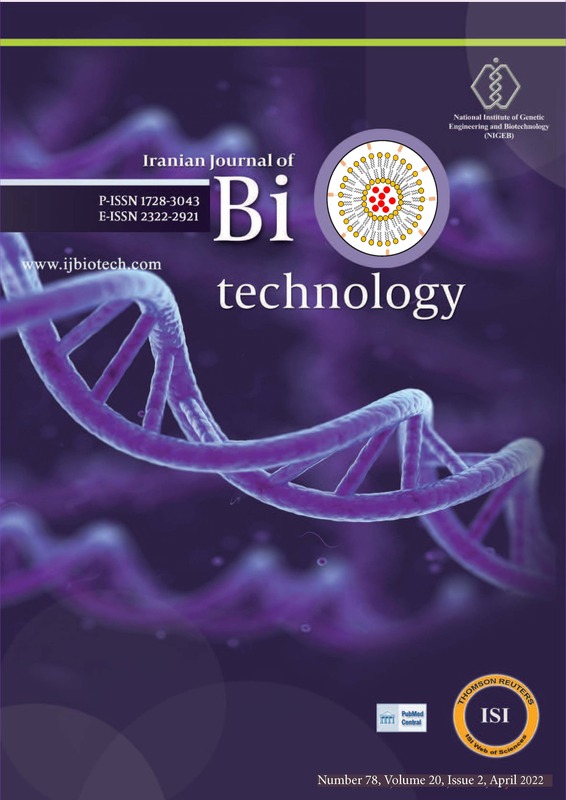 Iranian Journal of Biotechnology, 8, 1, 2010, 32-37. Nouri, M., Rahbarizadeh, F., Ahmadvand, D., Moosakhani, F., Sadeqzadeh, E., Lavasani, S., Khoddami Vishteh, V. (2010). 'Inhibitory Effects of Lactobacillus salivarius and Lactobacillus crispatus Isolated from Chicken Gastrointestinal Tract on Salmonella enteritidis and Escherichia coli Growth', Iranian Journal of Biotechnology, 8(1), pp. 32-37. Nouri, M., Rahbarizadeh, F., Ahmadvand, D., Moosakhani, F., Sadeqzadeh, E., Lavasani, S., Khoddami Vishteh, V. Inhibitory Effects of Lactobacillus salivarius and Lactobacillus crispatus Isolated from Chicken Gastrointestinal Tract on Salmonella enteritidis and Escherichia coli Growth. Iranian Journal of Biotechnology, 2010; 8(1): 32-37. Probiotics are live cultures of microbes; often lactic acid bacteria, but also some other species, which when fed to animals, improve their health and growth through altering the intestinal microbial balance. In the present research, healthy chickens’ gastrointestinal (GI) tracts were screened for the presence of lactic acid bacteria with probiotic properties. The probiotic properties of the isolates taken from different parts of the GI tract were evaluated. They were examined for resistance to 2% (w/v) bile salts and acidic pH, capability to adhere to the intestinal epithelium and inhibitory effects on the growth of Salmonella enteritidis and Escherichia coli. Fermentation profile analyses and sequencing data of the conserved 16S rRNA genes showed that from a total of five selected clones, four clones isolated from the duodenum and caeca were Lactobacillus salivarius and the fifth clone, isolated from the duodenum, was Lactobacillus crispatus. All the selected clones were able to adhere to the chicken’s epithelial cells. The lactobacilli isolated from different parts of the GI tract had probiotic properties suitable for use in animal feed. Due to the inhibitory effects of the isolated lactic acid bacteria on the growth of pathogenic microbiota, it can be concluded that these bacteria are good candidates for treatment of chicken GI infectious diseases. The change in the bacterial population of the chicken’s digestive tract depends on the its age and diet. In poultry, the lack of intestinal microbiota, as observed in newly hatched chicks, has been considered as a major factor in the susceptibility of chicks to bacterial infections (Netherwood et al., 1999; Patterson and Burkholder, 2003; Tierney et al., 2004). Chicks, reared under traditional animal husbandry methods, when exposed to faecal bacteria from healthy adult chickens, acquire early protection against enteropathogens (Nurmi and Rantala, 1973). Digestive microbiota have been shown, by the use of media-based culture techniques, to develop from simple populations in young chicks to more diverse mixtures in mature birds. The sterile gut of chicks will be colonized as early as 3 to 6 h after hatching as anaerobic bacteria break down uric acid. Streptococci and enterobacteria are the next species to colonize the small intestine and caeca within 2 to 4 days, post-hatch. Lactobacillus spp. have been found to predominate the small intestine and anaerobes, such as Escherichia coli and Bacteroides are the main bacteria that colonize the caeca after the first week (Mead, 1989). In the early years of the 20th century, Elie Metchnikoff had recorded, amongst his wide-ranging observations of factors affecting longevity, that Bulgarians consumed large amounts of fermented milk as part of their diet and that they were known to reach advanced ages by the standards of the day (Metchnikoff, 1908). In a time of relatively unsophisticated knowledge of the large bowel ecosystem, it was a small leap of faith to assume that the consumption of fermented milk would “implant” lactic acid-producing bacteria in gut and that these bacteria would proliferate and suppress the growth of putrefactive bacteria, just as had been observed with milk in the laboratory (Tannock, 2003). Following these observations, big efforts were made with regard to identifying pathogenic and food fermenting bacteria. These culminated in discovering the impact of commensal gut microbiota on health, leading to the concept of probiotic bacteria. Probiotics are live micro-organisms, generally regarded as safe (GRAS) for human and animal use. Administration of probiotics in human and animal models has proven to be beneficial in the treatment and prevention of intestinal infections and in the reduction of mucosal inflammation (Fuller and Gibson, 1997; Chen et al., 2009). Improved weight gain, increased egg production and decreased incidences of infections are amongst the several claims that have been made in association with these products (Netherwood et al., 1999). Dietary supplements for farm animals started and scaled-up rapidly in the 1960s and in the following years, lactic acid-producing bacteria were included as health-promoting agents. The Lactobacillus spp, members of Gram-positive lactic acid bacteria, are also GRAS. They are potentially food-grade, a status corroborating their particular suitability for oral therapeutic applications. The effectiveness of selected Lactobacillus strains to prevent and treat infectious bacterial and viral diarrhea, Helicobacter pylori derived gastroenteritis, and urovaginal infections has been demonstrated in well-designed in vitro and in vivo experimental studies (Isolauri et al., 1991; Hume et al., 2003). In chickens, Campylobacter, E. coli and Salmonella are the main pathogenic microorganisms that colonize the intestinal tract. These colonizers do not cause serious illness in birds, but Salmonella-infected chickens are pathogenic to humans, causing illness and even death through contaminated egg yolks or meat (Mishu et al., 1991; Saelinger et al., 2006). The objective of this study was to isolate and characterize lactic acid bacteria with inhibitory effects on the growth of E. coli and S. enteritidis, from the chicken gut. Isolation of bacteria: Two healthy 14-21 days old line 72 chickens were selected. These chickens were fed traditionally and housed at an ambient temperature of between 21 to 22°C. Different parts of the gastrointestinal (GI) tract of were isolated. Each part was separately washed in sterile phosphate buffer saline (PBS) (137 mM NaCl, 2.7 mM KCl, 10 mM Na2HPO4, 2 mM KH2PO4, pH 7.4). The entire tract was cut into smaller sections, transferred to 50 ml sterile tubes containing sterile PBS and vortexed vigorously for 1 min. The sections of tissue were then removed and the supernatants were centrifuged at 4°C for 20 min at 6000 ×g. The supernatant was removed and the precipitates was diluted (1:100), cultured on Rogosa agar plates (Merck, Germany) and incubated for 48 h in an anaerobic jar at 35 ± 2°C. This procedure was separately performed for each part of the GI tract (gizzard, intestine and caeca). The cultured plates were checked after 48 h and seventy colonies representing different parts of the GI tract were randomly selected and sub-cultured onto new Rogosa agar plates. Each colony was then cultured in de Man, Rogosa and Sharpe (MRS) broth (Merck) under anaerobic condition at 37°C. The resulting cultures (in MRS broth) were then stored at -70°C for further usage. Assessment of probiotic characteristics: Criteria for screening of Lactobacillus strains for use as probiotics include functional characteristics such as the ability to resist environmental conditions found in the GI tract (low gastric pH and bile salts), ability to adhere to host intestinal mucosa and antagonize or competitively exclude pathogens by secretion of antimicrobial substances or to compete for nutrients and adhesion sites (Blom and Mørtvedt, 1991; Abee et al., 1994; Jacobsen et al., 1999). Sensitivity to bile salts and acidic pH: Resistance to bile salts was checked by the ability of isolates to grow on Rogosa agar containing 2% (w/v) bile salt (Merck). The cultures were checked after 48 h of anaerobic incubation at 37ºC. Resistance to acidic pH (pH 3.0) was checked by centrifuging the overnight cultures of the isolated bacteria at 6000 ×g for 15 min at 4°C and re-suspending the pellets in the same volume of 0.9% (w/v) NaCl, pH 3.0. The suspensions were then incubated at 37°C for 3 h under anaerobic conditions. After centrifuging the cultures, the resulting pellets were plated onto Rogosa agar and incubated anaerobically at 37°C for 48 h.
Inhibitory activity: The overnight cultures of the isolated bacteria in MRS broth were centrifuged at 4°C as described above and the pellets were streak-cultured on brain heart infusion (BHI, Merck) agar plates cultivated with Escherichia coli and Salmonella enteritidis and were incubated overnight at 37°C. The growth inhibition zones were checked after 48 h. In an alternative test, the inhibitory effects of the isolated supernatants on the growth of E. coli and S. enteritidis in BHI broth were also evaluated. In vitro adherence of selected isolates to epithelial cells: The ileum segments from the 2-10 days old chickens were opened and washed five times with sterile PBS (pH 7.2). The epithelial cells of ileum segments were scrapped into sterilized PBS by a cell scraper. The cell suspensions were examined by microscopy to ensure that the epithelial cell concentration was adjusted to 5×105 cells/ml and that there were no adherent bacteria on the surface of the epithelial cells For this purpose, a human squamous cell line (A431) was used as a negative control. The adherence of the putative lactic acid bacteria strain to the epithelial cells was assayed as follows: the overnight cultures of lacteic acid bacteria were centrifuged and the cell pellets were resuspended in PBS (pH 7.2) leading to approximately 0.5×109 CFU/ml. One ml of each of the selected lactic acid bacteria suspensions was mixed with 1ml of the eukaryotic cell suspension. The mixtures were shaken gently in a glass plate at 37°C for 1 h. Adhesion was observed under a 200x magnification by phase contrast microscopy, after staining by 0.5% (w/v) crystal violet for 5 min. Gram staining: Selected clones were stained by Gram staining reagents (Merck) using standard procedures (Sambrook and Russell, 2001). Molecular characterization: I) Preparation of DNA template: the selected isolates were cultured in MRS broth for 16 h at 37°C. After centrifugation at 6000 ×g at 4°C for 15 min, the pellets were washed twice in PBS. Genomic DNA was extracted using the DNA isolation kit (Macherey-Nagel, Germany) according to the manufacturer’s instructions. II) Polymerase chain reaction (PCR) procedure for 16S ribosomal RNA: The 16srRNA gene is used for phylogenetic studies as it is highly conserved between different species of bacteria and archaea. 16S rRNA was partially amplified using Lactobacillus 16S rRNA specific primers by PCR. The primers, For-mehr-lac (5´ -AGAGTTTGATCCTGGCTCAG-3´ ) and Rev-mehr-lac (5´-AAGGAGGTGATCCAGCCGCA-3´ ), were designed in our lab using published sequence data available in sequence databases. The online Internet tools including ClustalW, Fasta3 and MEGA4 were used for identifying the primers with desired specificity towards a conserved domain of the Lactobacillus 16S rRNA sequence (Woo et al., 2002). After gel electrophoresis (Sambrook and Russell, 2001) and extraction of the PCR products using the QIAquick gel extraction kit (Qiagen, Germany) they were sequenced. The results were finally checked with Genbank reports (NCBI). Fermentation profile: The selected colonies of the isolates were cultured on Rogosa agar plates separately. After 24 h of incubation at 37°C, the cultured cells were suspended in API50CHL medium, prepared according to the manufacturer’s instructions. The carbohydrate fermentation profiles of the bacterial colonies were checked by the API50CH kit (BioMérieux, France). A positive test was indicated by a color change from purple to yellow due to anaerobic production of acid. For the esculin test, a color change from purple to black was considered as a positive case. The homogenized suspension of each isolate was transferred into a tube of kit and covered with sterile mineral oil (Sigma, USA) to maintain anaerobic conditions. All inoculated trays were incubated at 35 ± 2°C and checked after 24, 48 and 72 h for changes in color. Isolation of bacteria: After 48 h of anaerobic incubation at 37°C on Rogosa agar plates, over 1000 colonies of putative lactic acid bacteria were isolated from chickens’ GI tract including gizzard, intestine and caeca. A total of 70 colonies from each section of the GI tract were randomly selected for further investigation. Inhibitory characteristics: The selected isolates could all grow in MRS medium containing 2% w/v bile salt and were viable at pH 3.0. Upon screening of the colonies for inhibitory effects on the growth of E. coli and S. enteritidis, the bacterial cultures (S. enteritidis and E. coli) with 0.5 and 4 McFarland turbidities were produced in liquid medium supplemented with 50% supernatant of the selected clones and without supplementation, respectively. In these inhibitory assays, 31 colonies inhibited the growth of S. enteritidis and 27 colonies inhibited that of E. coli. Among these isolates, 5 colonies with the strongest inhibitory activity on the growth of both S. enteritidis and E. coli were chosen for further investigations (Table 1). No isolates from the gizzard or crop showed any inhibitory effects on the growth of these two pathogenic strains. In evaluation of the adhesiveness properties of the isolates with regard to the ileum segments, those bacteria showed an adhesion efficiency of at least 20 bacterial cells per epithelial cell. Strain identification: Gram staining results showed that all of the selected colonies (C2, C3, C5, C14, C15) were Gram-positive bacilli. Genomic DNA extracted from each selected colony was used as template in the PCR procedure. The PCR products showed a 670 bp band on 1% (w/v) agarose gel (Fig. 1). The 670 bp bands extracted from the gel were sequenced. According to the results of 16S rRNA sequencing, four out of the five selected colonies were genetically identified as Lactobacillus salivarius (C15, C3, C2 and C5), of which two (C15 and C3) originated from the small intestine and the other two (C2 and C5) from the caeca and duodenum, respectively. The fifth colony (C14), isolated from the duodenum was identified as Lactobacillus crispatus. Fermentation profile for these isolates was obtained by the API50CH fermentation assay. There were some differences in the fermentation patterns of the selected isolates. The fermentation profiles confirmed the identity of the genetically characterized strains. Interestingly, the strains of L. salivarius isolated from caeca showed different fermentation patterns when compared to those isolated from the small intestine. (fermentation pattern of C15 was D-Xylose+, Amygdalin+, Arbutin+, Salicin+, D-Maltose+, D-Celiobiose+, Tagatos+, L-Rhamnose-, D-Melezitose-, Xylitol-, Potassium Gluconate-, and C5 showed the converse results for these). Feeding farm animals with sub-therapeutic levels of antibiotics has been documented to increase weight gain and improve feed efficiency. The exact mechanism has not been completely understood. Since feed antibiotics provide a relatively greater improvement in farms with poor hygiene, their effectiveness seem to be at least partially due to the suppression of some pathogenic bacteria in livestock. Some scientists believe that this effect on pathogens is the primary or the only relevant effect of the antibiotics affecting growth promotion (Elwinger et al., 1998; Gusils et al., 1999a; Waldenstedt et al., 1999). Evaluation of the possible alternatives to sub-therapeutic use of antibiotics, one must consider not only their relative short- and long-term costs but also their ability to produce the same positive effects as the antibiotics. Interest in the use of probiotics to improve the growth and health of livestock has recently been rekindled by current proposals to curtail sub-therapeutic doses of antibiotics in animal feed. The results of experimental trials with probiotics, initiated 20-30 years ago, have been shown to be inconsistent due to variations in bacterial cultures used, age of pigs treated and other factors related to feed composition and husbandry practices (Bergonzelli et al., 2005). Probiotics, like antibiotics, appear to have a more pronounced effect on farms where housing and hygiene are not optimal (Audisio et al., 1999; Gusils et al., 1999b; Walter, 2008). Probiotic microorganisms added to the feed may protect farm animals from intestinal pathogens by several possible mechanisms, sometimes referred to as competitive exclusion (CE), which include: adherence to intestinal mucosa, thereby preventing the attachment of pathogens; production of antimicrobial compounds such as bacteriocins and organic acids; competition with pathogens for nutrients, and stimulation of intestinal immune responses. In addition, probiotics may affect the permeability of the gut and increase uptake of nutrients (Salminen et al., 1998; Maxwell et al., 2004; Collado et al., 2006). The following criteria are accepted as indicators for probiotics selection: resistance to acid and bile; attachment to epithelial cells; colonization of the intestine; production of an antimicrobial substance; good growth characteristics and beneficial effects on health (Madsen et al., 2001; Ghosh et al., 2004; Servin, 2004; Shin et al., 2008). During the recent years, researchers have focused on the investigation of Lactobacillus species, such as. L. plantarum, L. reuteri and L. salivarius to protect chickens against Salmonella. The growth inhibitory effects of these bacteria have been associated mainly with the production of antimicrobial metabolites (de Vos et al., 2005; Olivares et al., 2006). PREEMPT is the only probiotic product approved by the food and drug administration (FDA) of the United States of America for use in poultry. It is a mixture of 29 bacterial strains maintained in continuous cultures, freeze dried for administration to one day-old chickens. This probiotic is sprayed onto the birds and the bacterial inocula are then introduced into the gut when they preen their feathers. This mixture of bacteria colonizes the gut of birds and subsequently prevents the establishment of Salmonella species, commonly present as a contaminant of poultry feed (Saelinger et al., 2006). In this study, 5 isolates resistant to acidic pH and bile were selected. The results showed that they were part of the microbiota of the GI tract. The results of this study confirmed their ability to adhere to host intestinal mucosa, which is considered as an important selection criterion for probiotic bacteria. Their isolation from the GI tract of healthy chicks, plus their inhibitory effects on the growth of S. enteritidis and E. coli and good growth characteristics suggested that they can be used as probiotics in poultry (Vicente et al., 2008). Fuller and Gibson (1997) pointed out that host specificity of the adherence of lactobacilli is closely connected with the presence of some specific receptor molecules in the host cells, which can be recognized by specific molecules in the bacterial cells. The mechanisms behind the antibacterial activity of Lactobacillus probiotic strains appear to be multi-factorial (Servin, 2004). This effect probably results from the ability of probiotics to adhere to mucosal surfaces and inhibit the attachment of other pathogenic bacteria, to secrete factors with antimicrobial activity and to modulate cells of the immune system. In particular, by producing metabolites such as acetic and lactic acids, which result in a low pH and antibacterial compounds including bacteriocins, non-bacteriocins and non-lactic acid molecules, Lactobacillus strains inhibit the growth of bacterial pathogens and are sometimes able to kill them (Ghosh et al., 2004). Based on the sequence of 16s rRNA and fermentation profiles, the isolates were identified as Lactobacillus spp. – regarded as safe for probioics use (Rehman et al., 2008). By using preselected “good” microbes, it is hoped that inexpensive and identified bacterial cultures with the ability to reduce or exclude specific pathogens, such as S. enteritidis and E. coli and improve the health and growth of poultry, can be produced. This study has also presented a selection technique, which makes probiotics production economical. At present, ongoing studies are being carried out to use these biochemically and genetically identified lactobacilli as antigen delivery vehicles for immunization of poultry against different pathogens. The authors would like to thank Dr. Zahraei, University of Medical Sciences Tehran, Iran for providing Salmonella enteritidis. Abee T, Klaenhammer TR, Letellier L (1994). Kinetic studies of the action of lactacin F, a bacteriocin produced by Lactobacillus johnsonii that forms poration complexes in the cytoplasmic membrane. Appl Environ Microbiol. 60: 1006-1013. Audisio MC, Oliver G, Apella MC (1999). Antagonistic effect of Enterococcus faecium J96 against human and poultry pathogenic Salmonella spp. J Food Protec. 62: 751-755. Bergonzelli GE, Blum S, Brussow H, Corthésy-Theulaz I (2005). Probiotics as a treatment strategy for gastrointestinal diseases? Digestion 72: 57-68. Blom H, Mørtvedt C (1991). Anti-microbial substances produced by food associated micro-organisms. Biochem Soc Trans. 19: 694-698. Chen KL, Kho WL, You SH, Yeh RH, Tang SW, Hsieh CW (2009). Effects of Bacillus subtilis var natto and Saccharomyces cerevisiae mixed fermented feed on the enhanced growth performance of broilers. Poult Sci. 88: 309-315. Collado MC, Jalonen L, Meriluoto J, Salminen S (2006). Protection mechanism of probiotic combination against human pathogens: in vitro adhesion to human intestinal mucus. Asia Pac J Clin Nutr. 15: 570-575.
de Vos WM, Kleerebezem M, Kuipers OP (2005). Lactic acid bacteria - genetics, metabolism and application. FEMS Microbiol Rev. 29: 391. Elwinger K, Berndtson E, Engström B, Fossum O, Waldenstedt L (1998). Effect of antibiotic growth promoters and anticoccidials on growth of Clostridium perfringens in the caeca and on performance of broiler chickens. Acta Vet Scand. 39: 433-4S41. Fuller R, Gibson GR (1997). Modification of the intestinal microbiota using probiotics and prebiotics. Scand J Gastroentero Suppl. 222: 28-31. Ghosh S, van Heel D, Playford RJ (2004). Probiotics in inflammatory bowel disease: is it all gut flora modulation? Gut 53: 620-622. Gusils C, González SN, Oliver G (1999). Some probiotic properties of chicken lactobacilli. Can J Microbiol. 45: 981-987. Gusils C, Pérez-Chaia A, González S, Oliver G (1999). Lactobacilli isolated from chicken intestines: potential use as probiotics. J Food Protect. 62: 252-6. Hume ME, Kubena LF, Edrington TS, Donskey CJ, Moore RW, Ricke SC, Nisbet DJ (2003). Poultry digestive microbiota biodiversity as indicated by denaturing gradient gel electrophoresis. Poultry Sci. 82: 1100-1117. Isolauri E, Juntunen M, Rautanen T, Sillanaukee P, Koivula T (1991). A human Lactobacillus strain (Lactobacillus casei sp strain GG) promotes recovery from acute diarrhea in children. Pediatrics 88: 90-97. Jacobsen CN, Rosenfeldt-Nielsen V, Hayford AE, Møller PL, Michaelsen KF, Paerregaard A, Sandström B, Tvede M, Jakobsen M (1999). Screening of probiotic activities of forty-seven strains of Lactobacillus spp by in vitro techniques and evaluation of the colonization ability of five selected strains in humans. Appl Environ Microbiol. 65: 4949-4956. Madsen K, Cornish A, Soper P, McKaigney C, Jijon H, Yachimec C, Doyle J, Jewell L, De Simone C (2001). Probiotic bacteria enhance murine and human intestinal epithelial barrier function. Gastroenterology 121: 580-591. Maxwell FJ, Duncan SH, Hold G, Stewart CS (2004). Isolation, growth on prebiotics and probiotic potential of novel bifidobacteria from pigs. Anaerobe 10: 33-39. Mead GC (1989). Microbes of the avian caeca: types present and substrates utilized. J Exp Zool Suppl. 3: 48-54. Metchnikoff E (1908). The Nature of Man In: Studies in Optimistic Philosophy, William Heinemann, London. Mishu B, Griffin PM, Tauxe RV, Cameron DN, Hutcheson RH, Schaffner W (1991). Salmonella enteritidis gastroenteritis transmitted by intact chicken eggs. Ann Intern Med. 115: 190-194. Netherwood T, Gilbert HJ, Parker DS, O’Donnell AG (1999). Probiotics shown to change bacterial community structure in the avian gastrointestinal tract. Appl Environ Microb. 65: 5134-8. Nurmi E, Rantala M (1973). New aspects of Salmonella infection in broiler production. Nature 241: 210-211. Olivares M, Díaz-Ropero MP, Martín R, Rodríguez JM, Xaus J (2006). Antimicrobial potential of four Lactobacillus strains isolated from breast milk. J Appl Microbiol. 101: 72-79. Patterson JA, Burkholder KM (2003). Application of prebiotics and probiotics in poultry production. Poultry Sci. 82: 627-631. Rehman H, Böhm J, Zentek J (2008). Effects of differentially fermentable carbohydrates on the microbial fermentation profile of the gastrointestinal tract of broilers. J Anim Physiol Anim Nutr (Berl). 92: 471-480. Saelinger CA, Lewbart GA, Christian LS, Lemons CL (2006). Prevalence of Salmonella spp in cloacal, faecal, and gastrointestinal mucosal samples from wild North American turtles. J Am Vet Med Assoc. 229: 266-268. Salminen S, Bouley C, Boutron-Ruault MC, Cummings JH, Franck A, Gibson GR, Isolauri E, Moreau MC, Roberfroid M, Rowland I (1998). Functional food science and gastrointestinal physiology and function. Brit J Nutr. 80: S147-S171. Sambrook J, Russell DW (2001). Molecular Cloning: a Laboratory Manual, 3rd ed, Cold Spring Harbor Laboratory Press, Cold Spring Harbor: NY. Servin AL (2004). Antagonistic activities of lactobacilli and ifidobacteria against microbial pathogens. FEMS Microbiol Rev. 28: 405-440. Shin MS, Han SK, Ji AR, Kim KS, Lee WK (2008). Isolation and characterization of bacteriocin-producing bacteria from the gastrointestinal tract of broiler chickens for probiotic use. J Appl Microbiol. 105: 2203-2212. Tannock GW (2003). Probiotics: time for a dose of realism. Curr Issues Intest Microbiol. 4: 33-42. Tierney J, Gowing H, Van Sinderen D, Flynn S, Stanley L, McHardy N, Hallahan S, Mulcahy G (2004). In vitro inhibition of Eimeria tenella invasion by indigenous chicken Lactobacillus species. Vet Parasitol. 122: 171-182. Vicente JL, Torres-Rodriguez A, Higgins SE, Pixley C, Tellez G, Donoghue AM, Hargis BM (2008). Effect of a selected Lactobacillus spp-based probiotic on Salmonella entericaserovar enteritidis-infected broiler chicks. Avian Dis. 52: 143-146. Waldenstedt L, Lundén A, Elwinger K, Thebo P, Uggla A (1999). Comparison between a live, attenuated anticoccidial vaccine and an anticoccidial ionophore, on performance of broilers raised with or without a growth promoter,in an initially Eimeria-free environment. ACTA Vet Scand. 40: 11-21. Walter J (2008). Ecological role of lactobacilli in the gastrointestinal tract: implications for fundamental and biomedical research. Appl Environ Microbiol. 74: 4985-96. Woo PC, Fung AM, Lau SK, Yuen KY (2002). Identification by 16S rRNA gene sequencing of Lactobacillus salivarius bacteremic cholecystitis. J Clin Microbiol. 40: 265-267.